Linearity determines, or verifies, if the observations of a method are linear over a range of concentrations. A method measured on a continuous scale over a range of analyte concentrations. Analyte concentration,or relative analyte concentration (relative to concentration of other samples), must be known. Data in existing Excel worksheets can be used and should be arranged in the List dataset layout. The dataset must contain at two continuous scale variables, one containing the observations of the method and one containing the pre-assigned (known) concentration levels or, if the concentration levels are unknown, a code to indicate the relative analyte concentration. When entering new data we recommend using New Dataset to create a new linearity dataset. Select any cell in the range containing the dataset to analyse, then click Linearity on the Analyse-it tab/toolbar. Select any cell in the range containing the dataset to analyse, then click Analyse on the Analyse-it toolbar, then click Linearity. Click Concentration and select the variable containing the concentration level/coding. Click are and select pre-assigned if the concentration levels are known absolute values, or coded if the levels unknown and codes indicate the analyte concentration relative to the other levels observed. Click Variable Y and select the variable containing observations for the method. The report shows the number of observations analysed, the number of concentration levels/codes found and the range of analyte concentrations observed. For each concentration level, or coding, the number of replicates, mean, SD and CV concentration are shown. If concentration levels are known (pre-assigned) then the %recovered (ideally 100%) is shown. 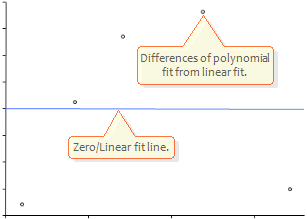 The linear and best polynomial fit, if a polynomial fit is better than a linear fit, are then compared. For each concentration level the mean concentration is shown against concentration levels predicted by the linear and polynomial fit. Non-linearity shows the difference between the linear and polynomial fits, and Non-linearity% expresses the same as a percentage of the concentration level (or mean if the concentration is unknown). Non-linearity differences will be small for a method with good linearity. 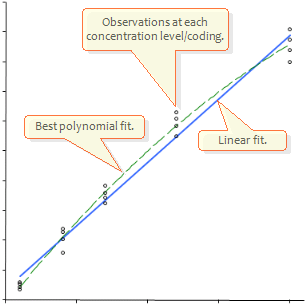 A linearity plot (see below) shows the method (Y axis) against the concentration level/coding (X axis) with linear and polynomial fits. The difference plot (see below) shows the difference between the linear and non-linear fits at each concentration level/coding. Ideally the differences should be small, indicating good linearity. Linearity can be compared against a linearity performance goal. Allowable non-linearity can be specified in absolute units of the analyte, as a percentage of analyte concentration, or as a combination of the two in which case the larger of the absolute and percentage concentration is used. If the Linearity dialog box is not visible click Edit on the Analyse-it tab/toolbar. Click Compare against and select Linearity specification. Enter Allowable non-linearity as an absolute value, as a percentage of analyte level, or enter both values for a combination. Tick with Allowable Error bands to show allowable error on the precision profile plot. The non-linearity goal at each concentration, calculated from the non-linearity specification and the concentration level, is shown alongside the non-linearity and non-linearity%. 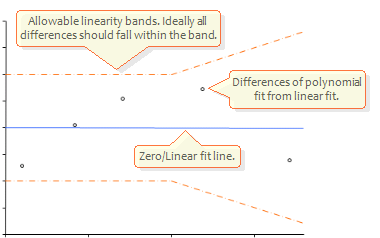 If with Allowable Error bands is checked the non-linearity goal is shown on the difference plot (see below). All differences should fall within the allowable non-linearity goal. Linearity can be compared against a linearity error% of a total allowable error goal. Total allowable error can be specified in absolute units of the analyte, as a percentage of analyte concentration, or as a combination of the two in which case the larger of the absolute and percentage concentration is used. Enter TEa (total allowable error) as an absolute value, as a percentage of analyte level, or enter both values for a combination. Enter % for Linearity error, the percentage of the TEa to allow linearity to vary within. Evaluation of the Linearity of Quantitative Measurement Procedures: A statistical approach. A Theoretical Evaluation of Linearity. A Quantitative Measure of NonLinearity.